A first-person account of the building of St. Francis Wood from one of the partners of the real estate firm of Mason-McDuffie. 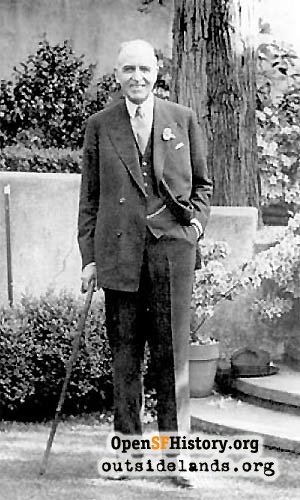 Duncan McDuffie at his Berkeley home. - Mason-McDuffie newsletter, House Key, Vol. XVI, No. 2, February 1977. More than a developer, Duncan McDuffie was a well-known conservationist. A hiker, a mountaineer, and later a president of the Sierra Club, McDuffie obviously took seriously the residential park idea of having Nature be part of the home in his St. Francis Wood development. "The founding of St. Francis Wood really goes back to that Arbor Day when, under the leadership of Adolph Sutro, a plantation of Monterey pines and cypress and of eucalyptus was made on the southwest slopes of Mt. Davidson. By 1911 this plantation had become a dense forest inhabited, as our friend George Kennedy would have us believe, by coyotes, wild cats, and mountain lions. Whether or not this be true, it had given a unique wooded character to the sea-ward looking hills not found elsewhere in San Francisco. 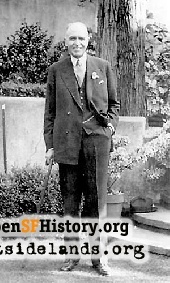 It was in this year that A. S. Baldwin, a man of great vision and one of San Francisco's finest civic leaders, secured an option on the Sutro estate extending from Ocean Avenue to Laguna Honda and embracing 700 odd acres, in the belief that it was destined to become San Francisco's best residential district. "It was also about this time that a group of men who had been associated for some years in the development of residential subdivisions in Berkeley, turned their faces toward San Francisco. Most of their purchasers of home sites in the University city had come from San Francisco, seeking the advantage of surburban conditions for their families. Why not provide San Franciscans with such conditions in the heart of San Francisco itself? Six months was devoted to a study of San Francisco conditions and possibilities--lines of growth, climate, topography, transportation and the like. "On a March morning in 1912 this Berkeley group, consisting of Louis Titus, C. C. Young, Perry T. Tompkins, Elmer I. Rowell and myself, climbed over the wooden fence that marked the western boundary of the Sutro property on Junipero Serra Boulevard and walked up a wood road toward Mt. Davidson. The day was sunny and brilliant; the trees rustled in a light breeze; the ground was carpeted with California poppies, cowslips, buttercups, wild pansies, babyblue eyes and iris. From open spots among the trees we could see the narrow ribbon of Sloat Boulevard unrolling to the beach, the shining shield of the Pacific and on the horizon the jagged rocks of the Farallones. "Here at last we had found the ideal site of the San Francisco peninsula for homes - a site of great topographical beauty, capturing the westward view and the southern and westward sun, beautifully wooded and with a perfect garden soil. "Transportation only was lacking and that was promised through the proposed Twin Peaks Tunnel. We then and there decided to purchase the area and to establish St. Francis Wood. [...]"
"The history of St. Francis Wood is as well known to some of you early residents as it is to me. I presume it is the obstacles that we had to meet and overcome that are burned deepest into my memory. The most difficult for us to meet was the lack of sales created by the World War. From the summer of 1914 to the Spring of 1919, almost no lots were sold. I remember that in 1915 our total sales aggregated $5,000. "In the meantime, interest, taxes and upkeep charges went on as usual and had to be met if St. Francis Wood was to survive. They exhausted our every resource and if it had not been for the wise and generous attitude of the banks, and particularly George Kennedy's bank, we would not have kept St. Francis Wood afloat. "This difficult situation created the temptation to turn from our original ideals. Among these temptations was pressure to cheapen street improvements, to reduce the size of lots, to encourage "jerry builders" and to let down on restrictions and architectural supervision. There were also opportunities to dispose of the property, but a sense of responsibility for our purchasers and an overwhelming desire to carry the enterprise through on the lines originally laid down, induced us to hang on no matter what the cost. "Among other obstacles was the long and often discouraging fight for the Twin Peaks Tunnel, which would never have been built except for the vision, courage and resourcefulness of Chief O'Shaughnessy [City Engineer] and the valiant aid of our good friend A. S. Baldwin; the fight for car services through the tunnel, which involved the controversial four-tracking of Market Street; and the never ending contest over the extension of Market Street. "As a result of the efforts of the officers of the Association, coupled with the lively interest of the members, St. Francis Wood has moved forward instead of backward. Reversing the history of most subdivisions, it is now more desirable as a place of residence than ever in its history. 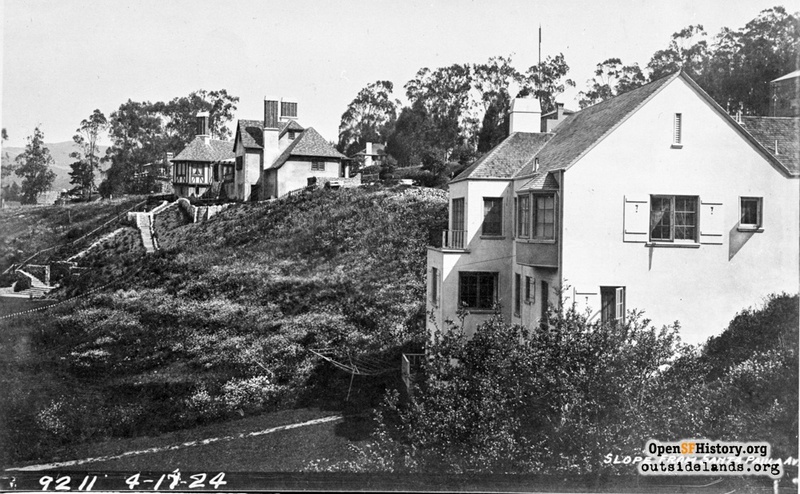 The ideals which its developers established for it have, through the efforts of its residents and the machinery of the St. Francis Homes Association, not only been achieved but surpassed so that today it fully merits the statement of Dr. Werner Hegemann, the great German city planner, who calls it 'the most distinguished residential suburb not alone in California, but in America.'" Contribute your own stories about St. Francis Wood.